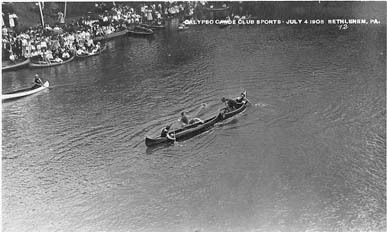 Calypso Island was a beautiful resort located on an island in the Lehigh River near Fountain Hill. The island was named for the beautiful sea nymph in Greek Mythology by State Representative George Henry Goundie during a Fourth of July celebration in 1869. Pleasure-seekers enjoyed the thirteen acres of natural grounds and the pleasure boats of every variety which surrounded it. Illuminated water carnivals took place on summer evenings. Transportation to the island was provided by the Calypso Transportation Line. The Lehigh Valley Railroad purchased the island in 1902 and removed most of the island to use as filler for construction of its rail line. In 1822 the Eagle Hotel was expanded from a store (built in 1784) to become Bethlehem’s second hotel to be located on Main Street. The first house built in Bethlehem in 1741 was torn down to make room for the livery staple for the hotel. Charles David Bishop was the first owner of the hotel. 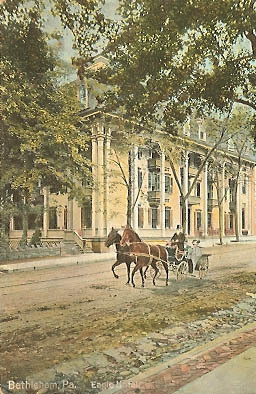 One hundred years later the hotel was replaced by the Hotel Bethlehem which is in operation today. The Broad Street Bridge was opened on May 17, 1871. It was an iron bridge of 460 feet which spanned the Monocacy Creek, connecting Main Street with West Bethlehem. In 1909 a new concrete bridge replaced it. Bethlehem Steel began as the Saucona Iron Company when it was first organized in 1857. Then it became the Bethlehem Rolling Mill and Iron Company on June 14, 1860. On May 1, 1861 the company’s title was changed again, this time to The Bethlehem Iron Company. In 1899, the company assumed the name, Bethlehem Steel Company.